This is our black Lab, Georgia. One warm day in early spring I caught her laying in the grass, lit up by the afternoon sun. I thought it would make a perfect painting for the mantle, something Kim and I can keep long after she's gone. 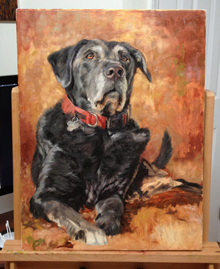 I painted some incredibly talented, award-winning English Pointers and an equally talented yellow Lab when I was in high school and college. 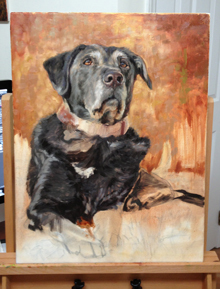 But since those early attempts, I hadn't put brush to canvas on a single dog in over a decade. 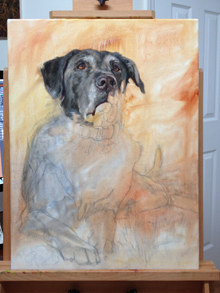 The eyes, especially the eyebrows, are crucial when painting Labs. 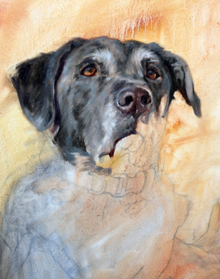 Their entire personality comes through in those expressive eyes, so I started the painting there and worked my way out. 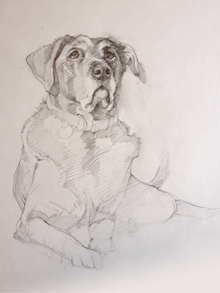 As a finishing touch, I positioned her tail in "mid-wag." 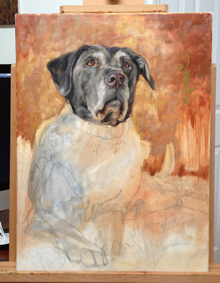 This wasn't in my reference photo, but I wanted to paint her in a way that embodies her personality. As she starts to gray, it hits me that we won't have her forever. 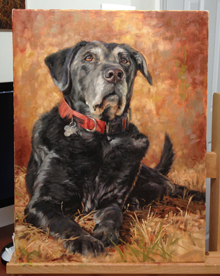 I'm glad I did the painting, as Kim and I will always have something to remind us of "G."